I'd best get all these vids done in the next 30 days as that's what Camtasia allows for a trial and I can't justify the cost of the software right now. However, I will say this - if I get enough donations to cover the cost I'll keep making them if they're helpful. 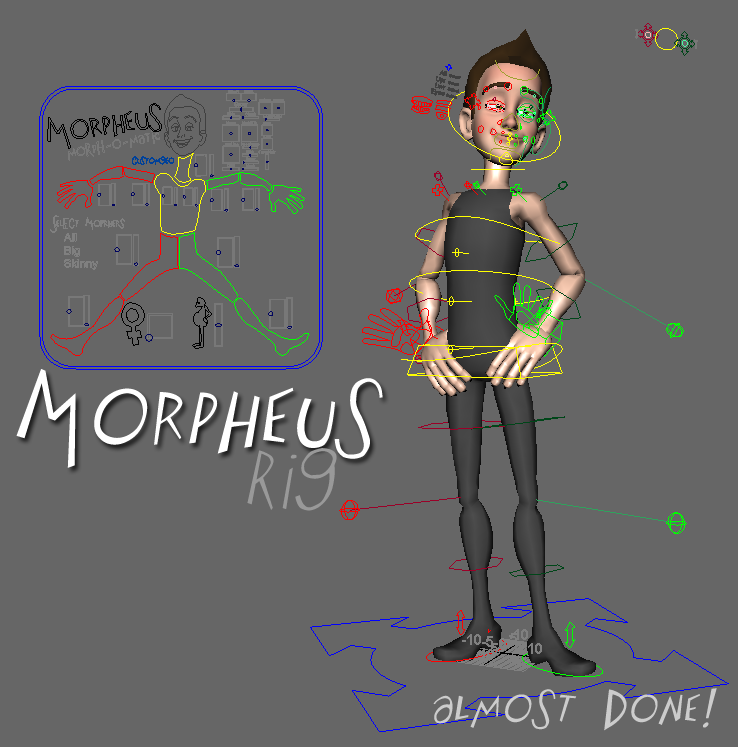 Next up for vids - "Morpheus Training: Making Morphy Your Own"
Download on the Morpheus project page! New wip docs are here. Okay, peeps. It's time to get your test on. I'll start working on the "Intro to the rig vid" tomorrow. Please note - This is NOT the final release version of Morphy. I'll be going through a series of release candidates until the rest of the major kinks are out before a full on "Morpheus Rig" release. As such, please don't point folks to the rig as a "done" rig if they're expecting everything to be done. Still working on documentation but the rough pass is up here. You'll need to read it to get the shelf installed should you wanna look at that. It is not necessary for the rig to work. Smoothers and visibility toggles are on "all_anim"
type "boTriggers" in the command line. If nothing happens, go back to the previous step. UI - the ui is in and working. There is a UI cam that the UI is constrained to in a certain space mode (that will make sense after the vid). This is also so that you can easily have multiple characters in scene and not have UI's on top of eachother. If you wanna turn off Squash and stretch for now, go to the anim expression editor and comment out any instances of "MorphySqshStrtch"
Gonna add a few more channels of movement on the lips but again, won't mess with your animation. You'll just have a bit more control. In America means trading one's workweek labors for that of driving long distances to see family or something "neat." In our case we headed to land of my upbringing - Oklahoma. Yes, the wind was sweeping down the plain. Also, I ate way too much. As I recently said, Morphy progress has slowed as I started a new animation gig which is gonna be a lot of fun. Still working on getting a feel for the characters but it feels good to stretch the animation muscles again after their break of the past few months workin mainly on rigging. Been getting some great feed back from people and did make a few fixes in the wee hours of the night last week. Added in the pony tail and pig tail rigs that will show up when you choose those hair option now. 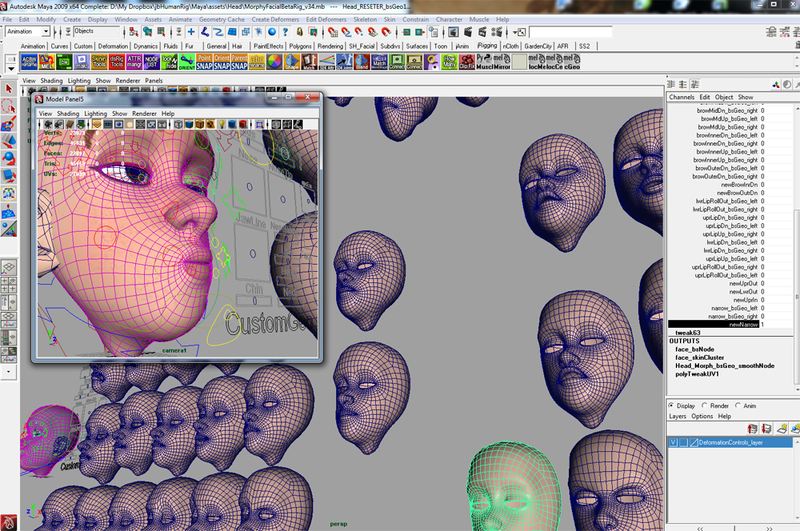 Thanks to Mary Barreiro for doing those rigs and making it so easy to roll them in. TSM Morpheus version - Several of my friends are big Setup Machine fans and I was thinking about doing a TSM body version of Morpheus if there was any interest. 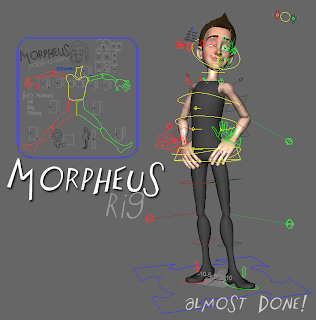 It would only be an additional option for using Morpheus if folks like that rig and would illustrate the idea of using the head on different rigs as well. I already have the setup file done so it wouldn't be much hassle. If you're interested. Lemme know. 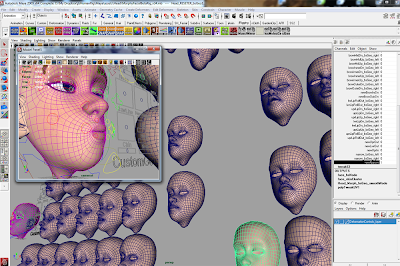 Facial - If you start doing facial animation tests or lip sync tests, please let me know if you're having trouble hitting poses you want. Been getting mixed feedback on this one as well and I've not had (and won't have) time to test it myself for a while.